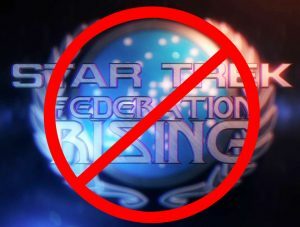 BREAKING NEWS: “STAR TREK – HORIZON” SEQUEL, “FEDERATION RISING”, SHUT DOWN. Earlier today, executives from CBS reached out to me and advised me that their legal team strongly suggested that we do not move forward with plans to create a sequel to Horizon. While this is a sign of the current climate that we find ourselves in with Star Trek fan films, I want to personally thank CBS for reaching out to me, rather than including us in their ongoing lawsuit against Axanar. It was conveyed that the reason CBS was reaching out to me was due to the legal troubles stemming from the Axanar case. Again, CBS did not have to reach out personally. The message I received felt more like they were giving me a heads up before we got too involved in another project, rather than a group of angry executives swinging a hammer. On behalf of myself and Ryan Webber, my co-writer and co-producer on Federation Rising, we appreciate your initial support and are saddened that we cannot bring you what we believe was a fantastic feature film. However, rest assured that Ryan and I are committed to continuing our storytelling partnership with an original project. We also welcome other fan productions and fan film lovers to join us on this new venture. While we initially planned to debut our Kickstarter for Federation Rising this Saturday, we hope that you will instead stand with us as we announce an original sci-fi project that Ryan and I have been co-developing in addition to Federation Rising. We’re incredibly excited to tell you about this completely original story that follows the ideals set forth by Star Trek that Ryan and I have been such huge fans and admirers of our entire lives. Please stay tuned for this Saturday’s announcement.